Norman McLaren joined the National Film Board of Canada at John Grierson’s invitation in 1941. Quickly imposing his talent, McLaren founded and supervised NFBC’s animation wing, eventually becoming the most lauded Canadian filmmaker of all time. Begone Dull Care won six international prizes between 1949 and 1954 (1). Begone Dull Care shines with his masterful use of scratching and painting on film stock. McLaren used such manipulations of celluloid, pioneered in experimental film by Len Lye (2), at the Glasgow School of Fine Arts in the early 1930s, helping to account for the film’s striking similarities to Lye’s A Colour Box (1935). Conceived as an advertisement for Britain’s GPO Film Unit, A Colour Box submits publicity to a filmmaker’s artistic vision. Painted film strips call the viewer’s attention to the beauty of the spectacle before announcing the new British postal fees. In Begone Dull Care, McLaren adds complexity to Lye’s compositions, emphasising sound/visual synchronisation and generating depth on his mobile canvas. 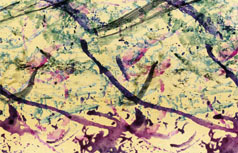 The film gives warmth and movement to compositions resembling a constantly morphing Jackson Pollock painting, yet never fails to remind us of its very calculated aesthetics when it suddenly adapts to the score’s slower movements and shifts from expressionistic and oversaturated explosions to minimalist vertical lines that vibrate accordingly to Oscar Peterson’s piano. Begone Dull Care takes the minimalism of McLaren’s Dots (1940) a step further. Abstract to the extreme, the latter synchronises a series of heterogeneous sounds to a ballet of blue dots executing evermore complex patterns as the soundtrack’s rhythm changes. This primitive dance contains the embryonic structure of Begone Dull Care. Yet two major differences place it “above” Dots in evaluations of McLaren’s work. First, the minimalism of Dots translates into a limited use of colour. The absence of variations in the palette (and mostly the uniform red font) limits movement to the frame. Begone Dull Care endlessly regenerates and redirects visual expectations by structuring itself around a vertical stream of unique motifs. Second, the soundtrack of Dots was drawn on the film stock as well, thus easing its synchronisation: sound and visuals could evolve symbiotically. Begone Dull Care had to submit its visuals to the Oscar Peterson Trio’s complex score, extending its formal merits to a technical accomplishment based on precision. Instead of calling attention to itself as a collage of successive interventions of the filmmaker, McLaren’s composition blends with the music in one homogeneous whole providing appropriate accompaniment to each of the music’s three movements. The first segment associates a visual theme to specific instruments of Oscar Peterson’s trio. The bass generally responds to red occurrences, while the piano echoes a set of three parallel lines, vertical or horizontal. McLaren also reveals the simple yet efficient logic of the film’s formal articulation: the complexity of the visual motifs increases proportionally with the complexity of the musical score. The ending of this segment validates this contention: coinciding with the last bass notes, three vertical yellow lines on black font merge as one. We are reminded that sound is the product of vibrating chords, while McLaren forecasts the structuring motif of the second movement. The second segment is slower. Every note coincides with a vertical line on black font. McLaren creates the illusion of depth. As every note loses its intensity, its corresponding trait vanishes as a distant dot. Music is given materiality as it dances in an infinite monochromatic space. As the piano kicks in, every set of notes resonates visually with three parallel vertical lines. This crescendo announces the finale. The third segment is the fastest. If the frenetic speed of the music forces McLaren to render a less calculated symphony of multi-layered expressionistic arrangements, he reaffirms his control in two less chaotic passages. When the bass leaves, parallel yellow lines on blue font reiterate their visual correspondence and change directions with every new set of piano notes. When the percussion gives way to the bass, the font turns black and the leading visual motif becomes more abstract (yet still changing accordingly to Oscar Peterson’s piano). The absence of percussion translates into darker visual texture. If bass has less presence than percussion, it nevertheless accentuates musical depth (remember the illusion of depth of the second segment that could only be suggested on a black font). The cacophonous finale translates into a beautiful chaos of colours, before ending just as the film started: in perfect sync. Begone Dull Care is a carefully structured work. It demonstrates how animation techniques offer the rare possibility to experiment with film’s basic elements: lines, movement, colour, texture and visual rhythm (3). It also illustrates “the logical structure of the musical form” (4). Finally, it is no coincidence that McLaren translated the introductory credits into seven languages. Indeed, his demonstration gives a new meaning to music as a universal language. Yet just like language, if such beauty is to be understood, it has to be seen and heard. Derek Elley, “Rhythm ‘n’ Truths: Norman McLaren”, The Canadian Film Reader, ed. Feldman and Joyce Nelson, Peter Martin Associates, Toronto, 1977, p. 94. Dominique Noguez, Éloge du cinema expérimental: définitions, jalons, perspectives, Centre Georges-Pompidou, Paris, 1979, p. 37. Germaine Warkentin, “Norman McLaren”, Documents in Canadian Film, ed. Douglas Fetherling, Broadview Press, Toronto, 1988, p. 69. David Clandfield, “Animated Film and Experimental Film”, Canadian Film, Oxford University Press, Toronto, 1987, p. 113. Paul Melançon graduated in law at University of Montreal before completing a BA in fine arts at Concordia University, where he is now doing his MA in film studies. He is currently preparing an article for a collective work on contemporary remakes and the horror genre to be published in Italy this summer. His thesis will focus on Terry Gilliam.